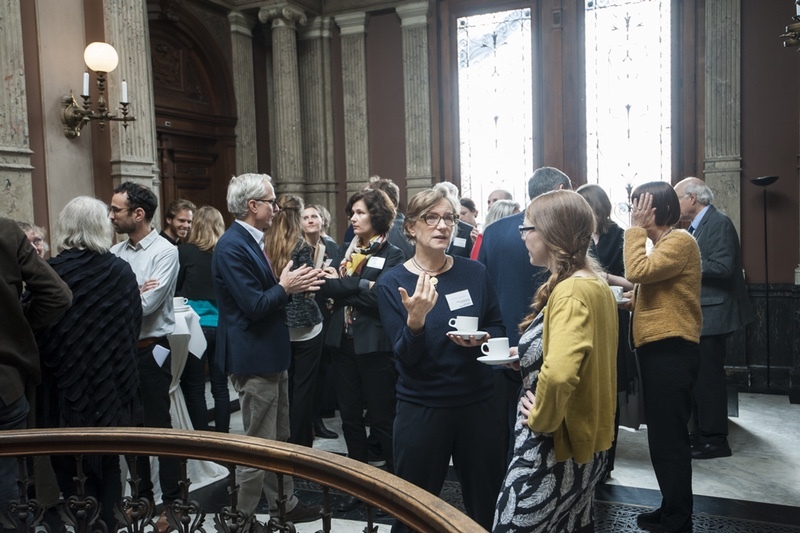 On April 20-22, 2017, the Teyler’s Museum hosted a very successful conference: Museums and (the loss of?) the Encyclopedic ideal. 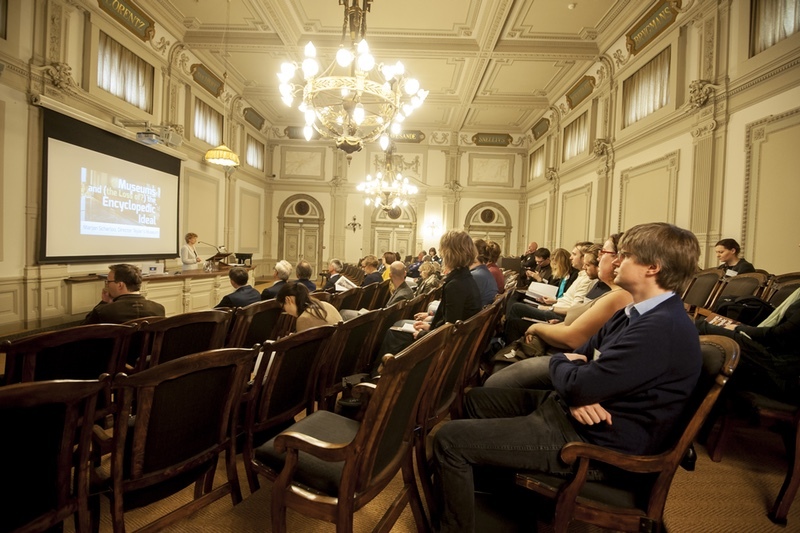 The conference kicked off on Thursday afternoon with a tour by museum Head of Collections, Herman Voogt and conference host Ilja Nieuwland, which underlined the importance of the conference location within academic research, whilst showing some of the museums finest objects like hoaxed fossils and the world famous electrostatic generator; the eighteenth century oval room; and the stunning library. After a dinner break, keynote speaker Wijnand Mijnhardt spoke on The world we have lost. In praise of a comprehensive ideal of science and scholarship. In his address, Mijnhardt started off with a search for the origins of the stages of development of knowledge, and the split between the different types of academic research, particularly philology and mathematics. He argued that the keystone to the parting process was the professionalisation of scholarship, and that this is a purely historical separation. Mijnhardt finished by stating that scientific changes may often last longer than humanities, but that none lasts forever, and we therefore need to discard the simplistic notion that measurement is all-important. This notion made for a fruitful discussion at the reception and proved to be useful throughout the remainder of the conference. 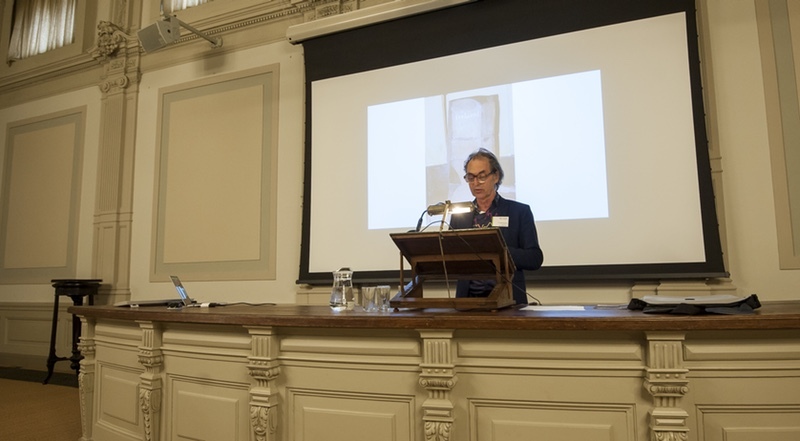 The second day opened with a word of welcome by Museum Director Marjan Scharloo, who hoped the conference might contribute to the understanding of the unique past of encyclopaedic museums. 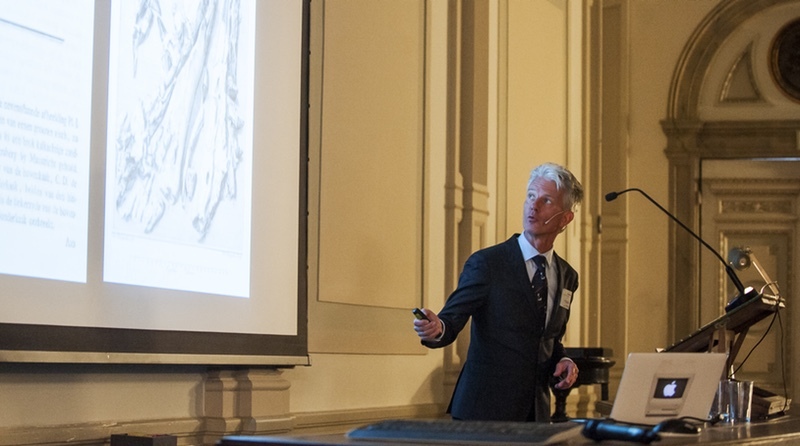 It was on that note that Eric Jorink, Teyler’s professor at Leiden University, chaired the first session of the day, “Teyler’s Museum as a link in an international network, or ‘knowledge hub’ 1785-2017″. Bert Sliggers, who had received his PhD just three weeks prior to the conference, had the honour of kicking off with a paper on the international networks of the museum’s de facto founder, Martinus van Marum. Sliggers, until his recent retirement curator at Teyler’s, argued that the main way Van Marum built up the collection was by undertaking frequent journeys. For his research, he made use of Van Marums unique labelling and correspondence system, which gives a unique insight into Van Marums eighteenth-century ways of research, acquisition and motives. This showed that trade and science worked together hand in hand. Van Marums greatest achievement however, according to Sliggers, was the creation of the Teyler’s collections in such a modern way, even for today’s standards. Holger Zaunstöck argued that it is important to look at networks of collections. He followed August Herman Niemeyer and his Halle orphanage, along with the upcoming ‘school town’ and educational lessons objects could offer. Niemeyer, largely responsible for the make-up of the collection at the Halle orphanage, visited Teyler’s Museum and Van Marum, though he did not always agree with the latter. As a result of his findings, Zaunstöck proposed an outlook on the sociability of collections in further research. 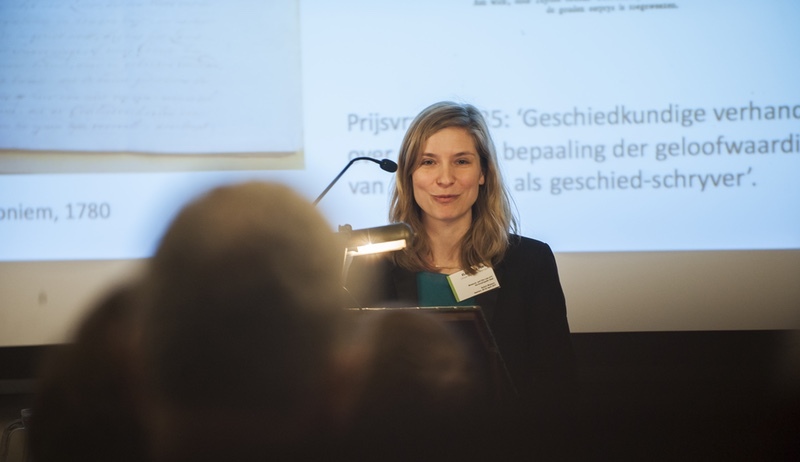 University of Amsterdam researcher Eleá de la Porte briefly propagated how prize questions subtly show insights in Teyler’s Museum. Members of Teyler’s Second Society tied questions to present day concerns, the primary aim being to gain insight into the past. They chose a philosophical approach for their prize questions, which is why they wanted participants to build upon predecessors; in other words, a form of scholarship well-known since the 17th century. In this, De la Porte claims, they show progress of historical knowledge. In 1885 a new hall opened in Teyler’s Museum, evolving around natural scientists. Ilja Nieuwland explained how curator Tiberius Winkler decided in favour of the new wing both to mitigate a chronic lack of space but also because of the prestige it would bring. A change occurred in collection practices, the main focus now being the fossil collection, with Dutch objects put central in the exhibition. Compared to other prestigious European museums however, the Teyler’s decors were a bit old-fashioned, with Darwin’s evolution theory markedly absent. The new wing was a success for approximately 25 years, but due to the changes in mode of operation, inward-looking curators, and a lack of the superlative, Teyler’s started its decline shortly thereafter. The afternoon session focused on Religion and the development of new scientific ideas and was chaired by Debora Meijers. Eric Jorink treated the ‘fluid’ concept of the museum, both in space and in time. Science, religion, art and commerce could largely overlap, and there was no fixed conceptual framework. Collecting was mainly a private matter in the Netherlands, and Teyler’s was a place of research. According to Jorink, there were three factors at work: the biblical framework, the argument from design, and the personal experience. University of Cambridge researcher Scott Mandelbrote started by referring to Jorink and Mijnhardt. He agreed that there is a broader picture which operates from the late 17th century and experiences various challenges around 1800. He stated, however, that the change takes place later – in the 1850s/1860s. Instead of taking the state-funded French example, he presented England, where almost everything was privately funded. By exploring the role played by the physical remains of the past in shaping them, Mandelbrote described an evidence-based world history. Particularly important were the co-occurrence of history, natural history and the Bible, and the accidental nature of fossils. The third speaker, Frans van Lunteren, started by stating that the transition of scientists who present themselves as experts who strive for authority, social legitimacy and the exclusion of non-experts, occurred more or less around the middle of the 17th century. He related two different genres with the help of the case of Frederik Kaiser: popular science and physico-theology. Van Lunteren concluded that the rise of popular science was intimately bound up with the construction of forms of expertise that assigns the production of knowledge to new intellectual elites. This new professional attitude was no longer compatible with teleological or religious considerations. And this meant that to a certain extent, popular science gradually replaced natural theology. Last one to speak on Friday was Ann-Sophie Lehmann, who stressed the extreme importance and revolutionary nature of images in education, as exemplified by Comenius’ work proved in 1658. The object book became more important, accompanied by a box filled with real objects, to which the notion of the hand, the head and the heart are key. These object books often lacked the former moralizing ideal that the picture books possessed. Book and box were devised together. Lehmann stated that pictures were only substitute to objects, and ideally every good school should have the actual objects at hand to use in teaching. The second full conference day started off with Andrew Burnett’s keynote lecture Why an Enlightenment gallery at the British Museum? (And what and how?). Burnett demonstrated the recent restauration of the gallery, which – deducing from the few decorations in the room – was probably intended to illustrate the Enlightenment and rationality. The history of the room and the renovation were intended to complement one another; after all, the room was and is the exhibition itself. Principally debated was the matter of lighting: it was meant to closely resemble sunlight and should not be seen. The museum itself serves as an object of personal revelation, an experience of discovery, which closely resembles the new view of museums. Eva Dolezel opened the third session, The waning of encyclopaedism and the advent of specialised disciplined in a museum context. Her research shows how the reinvention of the Kunstkammer fitted within the tradition of an academic museum. The expectations of the new audience played an important role but the idea of a microcosm in a microcosm, which helped with the notion of the Kunstkammer, remained. Reinterpretation is key: some aspects of the Kunstkammer were rejected, but others embraced. The example of the Kunstkammer shows a history in transition. Debora Meijers treated the search for a higher unity between men and nature, which was felt to be lost in the romantic age, by focusing on Alexander von Humboldt and the habitat principle which is related to the revival of the encyclopedic ideal. According to Meijers, a new encyclopedic approach to nature was one of the preconditions for the introduction of habitat ensembles in the natural history museum of the 1870s/1880s. Publications set new bench marks for an encyclopaedic approach, comparing the art history with the natural world history. To understand the dynamics and the changes in collecting patterns, Martin Weiss looked at the value a collection has for the collector himself.The emphasis has traditionally been on the public and the exhibition, and such a shift in emphasis would actually make for a different type of research. Collectors had the ambition to ‘complete’ their collection; however, what is ‘completeness’? You need somebody that confirms your claims, and a public will play a confirmatory role in this respect. This makes the exhibition a key player. The encyclopaedic ideal thus is not lost, but you need to look at it from the level of collectors. Finally, Wessel Krul argued how during the 19th century, history lost its status as the default organisational principle for art. To prove his point, he used the example of the Rijksmuseum, which opened in 1885, but was deemed outdated within twenty years. To regain its prestige, a fundamental reorganization was necessary, and a special committee appointed. The reopening of the museum shows us three lessons. Firstly, a well-organized aesthetic presentation isn’t always what the public wants. Secondly, a clear separation between art and history is impossible to make. And lastly, people come to museums to amuse themselves, and learning something is part of such amusement. 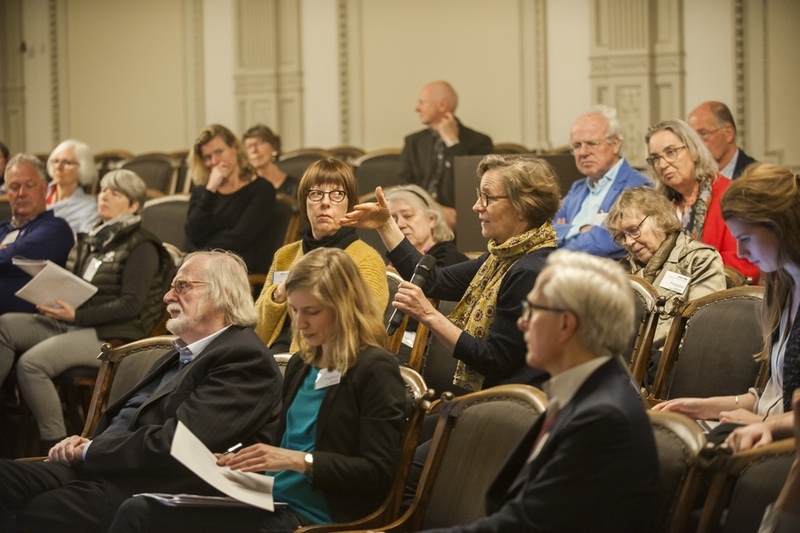 The final session of the conference zoomed in on Fine art in a scientific museum – connections, tensions and possibilities. Presenting Teyler’s collection of paintings as a pivot between the private learned society and the modern public museum, Terry van Druten showed how rather than curators or connoisseurs, it was the museum board that long decided what was to be purchased by the museum. As a consequence, art purchases reflected a more conservative influence. The concept of “art for art’s sake” is a very modern one, and was unheard of in the 18th and 19th century. A lot of misunderstandings regarding Teyler’s museum were born because of this notion. Arnold Heumakers used Karl Philipp Moritz as a personification of the concept of art within the Enlightenment debate. He posed the question of the purpose of a beautiful work of art, and argued that it finds it in itself. Heumakers argues that Moritz’ view disregards the usefulness of art: art is a substitute for religion, and the museum is the ideal temple for love and devotion. Autonomous art and religion together can function as a healing device. As the final speaker of the conference, Marcel Barnard argued that social identities are negotiated within the museum: it is not only a building with things, but it helps underline networks – in which religion again plays a role. The museum has the duty to make choices regarding ongoing discourses. In this, sacred means the opposite to the soft notion of god – the poetics of the possible that point to the inaccessible. This relates to the discourse by suspending the question of God, but instead temporarily point to god. During the conference it became clear that with regard to museums in general and Teyler’s in particular, there was no such thing as a loss of the encyclopaedic ideal. Although the 19th and 20th centuries the academic world saw the emergence of separate disciplines such as histry of art or pelontology, museums were in constant flux, and far from being fixed concepts or frozen institutions. Seen form a post-post-modern perspective, the separation between ‘art’’ and ‘science’ and between sacred and profane experiences are rather time-bound. The sense of wonder aroused by either works of art or nature were, and increasingly are again, at the core of the museum’s raison d’être.